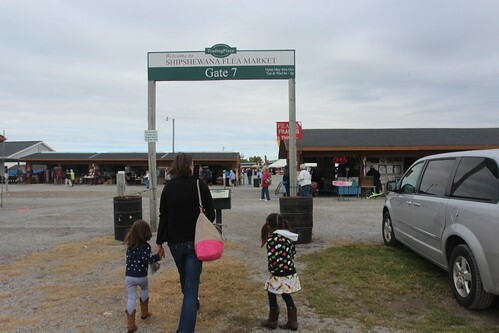 Mali Mish - Day 61: The Shipshewana Flea Market in Indiana. Thanks to its 5:30PM check out policy, today we are able to spend as much time as we want to at the Shipshewana Flea Market. It runs every Tuesday and Wednesday from April to the end of October and it is suppose to be the biggest in all of the midwest. The flea market is free although you do have to pay for parking. Since we are camped right next door, we just walked right in. 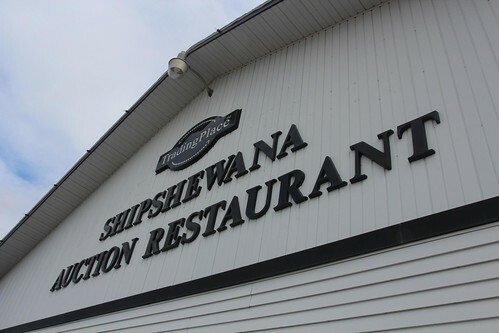 Shipshewana is, a town of only around 500 people. You wouldn’t know it by the size of their facilities in town. Just the campground alone can accommodate the entire town’s population. Needless to say they depend a lot on tourism. The flea market is big. However it is more like a swap meet these days with many of the stands selling new products instead of old garage finds. In the flea markets that we frequent, they are usually held in a big empty field. Each vendor has to setup its own table and its own awnings. 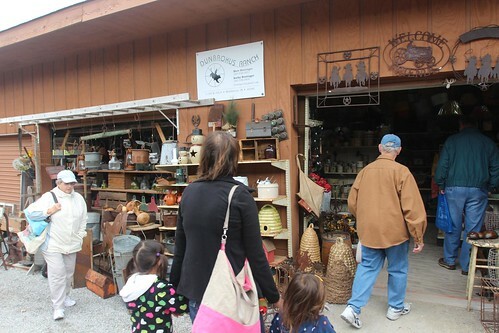 Here at the Shipshewana Flea Market, the vendors have their own permanent spaces to display their items. 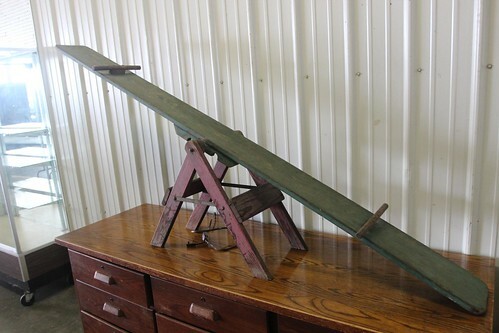 In a barn next to the flea market field, antiques were being loaded from truck beds and trailers into designated spaces on the floor of the building. This is actually where all the gems are found. Unfortunately, we are here a day early. The items in the barn are being setup for an auction that won’t take place until tomorrow afternoon. Ava really wanted this teeter totter. 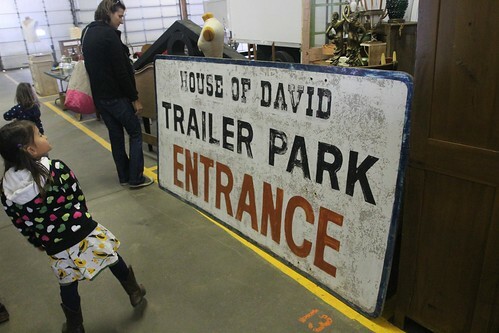 I really wanted this trailer park sign. I have no idea how I would haul it away if I bought it, but I’d know what to to name my trailer park if I bought it and opened one. Marlene is on a hunt for boat related antiques. She sees a nautical-themed room in our house with Luka’s name on it. 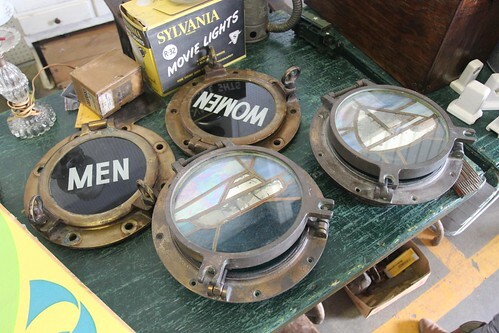 These bronzed portholes would look really cool mounted on the wall. Although the Amish are known for their delicious pies, Ava and Mila are not. 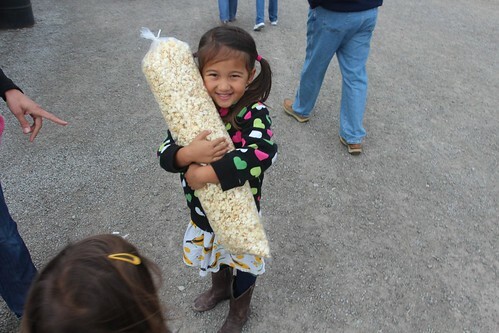 They opted for for a giant bag of kettle corn instead. That is until Ava saw this contraption. 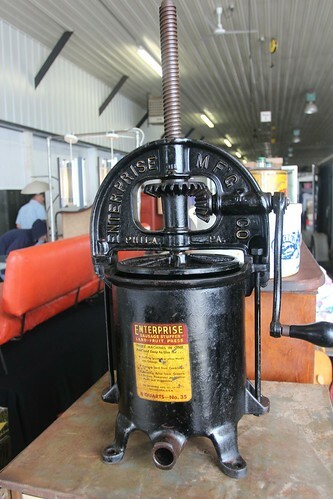 It is a 100 year old International Harvest gasoline engine powering a couple of ice cream makers. 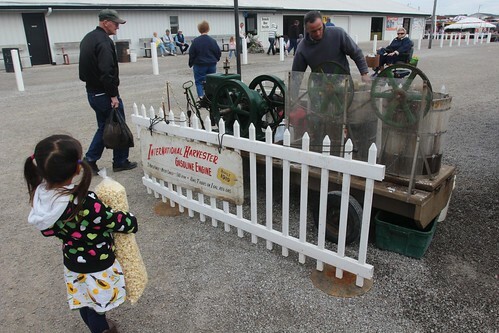 The rhythmic clinky-clank of the old motor running to power the churn handles on the wooden, ice-filled buckets full of cream and sugar was mesmerizing. 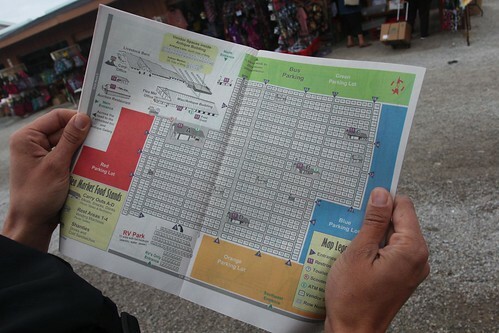 You can spend your entire visit on the flea market fairgrounds and never have to leave if you so desired. Besides the RV park and the market, there is also a home-style restaurant next to the auction barn. As you would expect, the food is great and very reasonably priced. 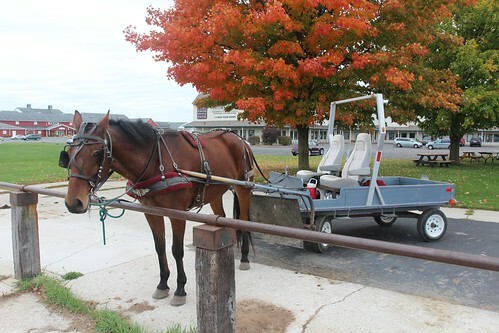 At most of the stores, there are parking lots and accompanying hitching posts for the locals who prefer a more traditional mode of transportation. 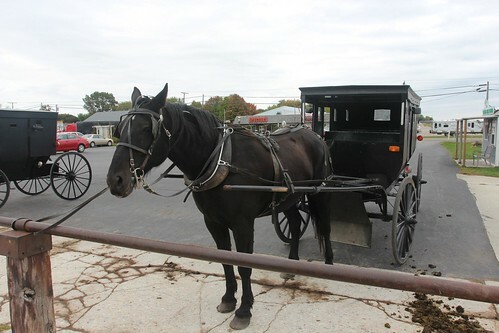 Because of the tourists that come each week for the flea market, now you can also take a tour of the town in an authentic Amish horse and buggy. We were not able to get on a tour for a couple of hours and we had plan to leave town before that so we regrettably decided against taking the tour. Not all buggies are of the ‘traditional’ style. This wagon is slightly more modern with pneumatic tires, automotive bucket seats and a safety roll-bar. Not only are the Amish self-sufficient, they are also generous. 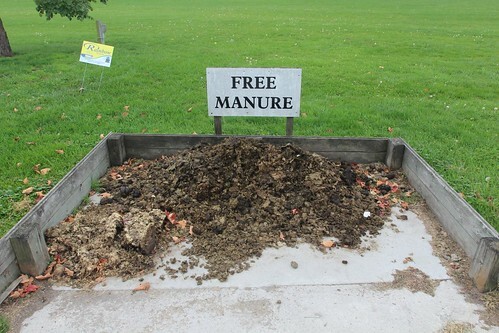 I had all the manure I wanted free of charge. 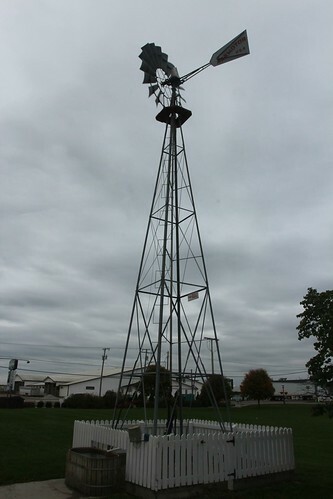 Next to the hitching post, there is a windmill that powers a well pump that automatically fills a water trough for the horses to drink from. Who needs electricity and city water? Marlene is an animal lover and has volunteered for years to rehabilitate injured wildlife for release from hummingbirds to opossums. 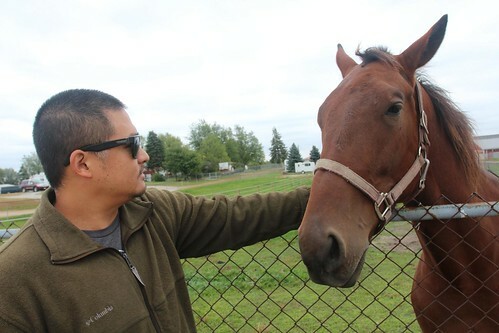 When it comes to horses, her knowledge of them is admittedly foreign. This little guy in a fenced in field next to the RV park was very gentle and friendly. We checked out of the RV Park shortly before 5:30PM and headed north towards Michigan. The Michigan border is only about 10 miles and our plan is to get back to Lake Michigan shoreline to continue our visit. Our transit today is only around 50 miles and we got to the Kalamazoo area in no time flat. There are a lot of great cities here for us to visit and the fall is a great time of year to visit Michigan. As long as the weather keeps holding up, we are hoping to make it as far north as we can short of the upper peninsula. 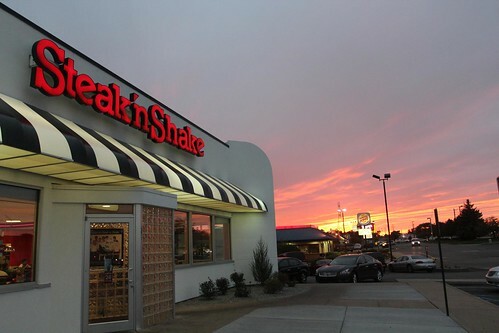 Time for milkshakes at our favorite midwestern burger joint. We will boondock tonight in a Walmart at a town just outside of Kalamazoo called Plainwell and continue to the lakeshore tomorrow for more exploring. 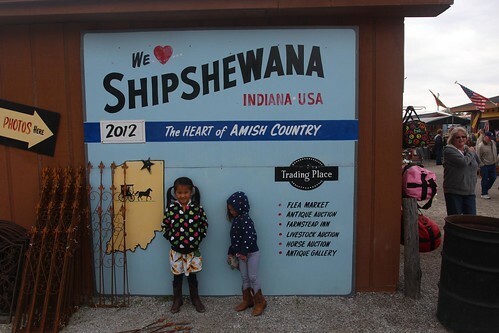 6 Responses to Day 61: The Shipshewana Flea Market in Indiana. 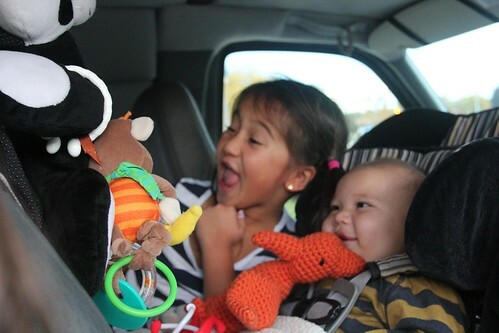 MsBoyink is from Kalamazoo – fun to see your home town areas through a travelers eyes. 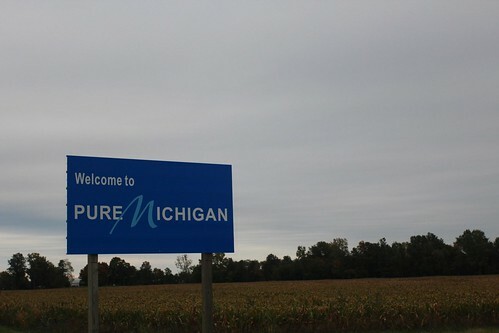 We’re always disappointed by how many folks skip Michigan on their cross-country travels. @Krista We didn’t even actually spend more than a couple of hours in Kalamazoo. Just a meal and we headed north for the night in Walmart in Plainwell. I wish I would have know about Bells! @Boyink We are very glad we got to spend some time in Michigan. Knowing that all these great places we have seen are here, we would have been very regretful of we missed it. I will definitely be on the look out for Oberon while we are here in Michigan! Drive safe and keep up the “burger reviews”!